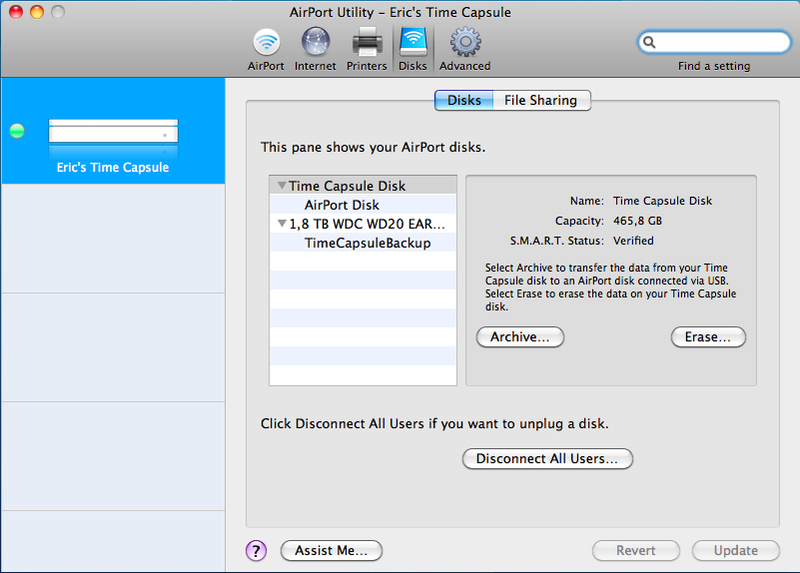 My Time Capsule disk died on me recently after upgrading to a bigger one. Luckily my MacBook did not do the same so I could revert back to my old disk and start over with an initial backup. This got me thinking about backing up my Time Capsule itself. The disk that died was a Western Digital and since it was only a few months old I got a replacement disk after sending it to Germany. I planned to use the new disk as the backup disk and put it in a USB casing. 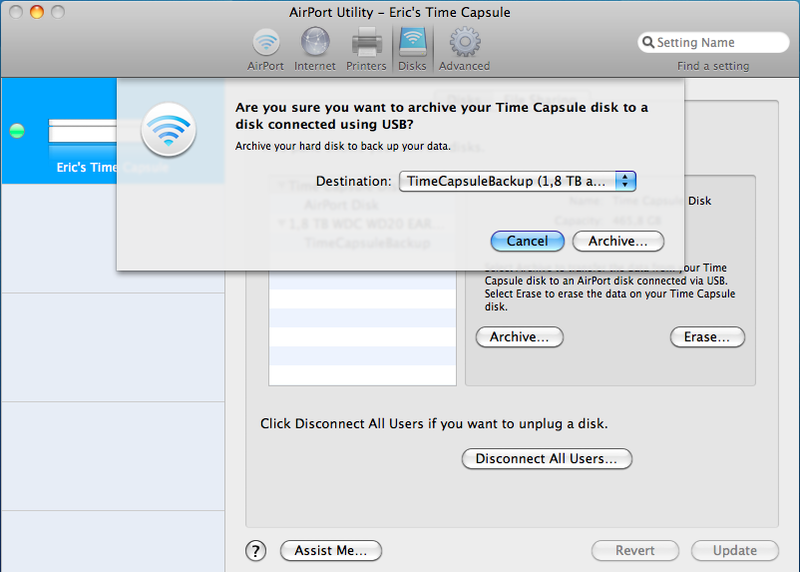 The Airport Utility that came with the Time Capsule has an Archive option that copies everything on the internal disk to a disk attached to the USB port. After selecting the disk and confirming, you see the amber light blink until it is ready. To copy 200Gb it took about 9 hours. Not a speed record, but keep in mind you will only do this once or twice a year. That is my planned frequency. Afterwards I attached the disk to my MacBook and found a folder called AirPort Disk Archive with my sparsebundle file (TimeMachine) and everything else that was on the Time Capsule. As my wife still uses Windows XP, I use the SMB share option to backup files to the Time Capsule from her machine. The problem with the WD disk was it did not stop spinning in the Time Capsule as the original disk does. I don’t expect my replacement drive to die on me soon, as I will be using it only to backup my Time Capsule. This entry was posted in Tooling and tagged apple, backup, Network, Productivity, time capsule. Bookmark the permalink.